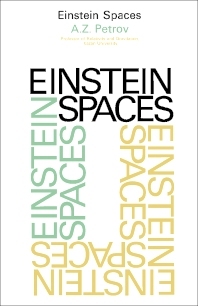 Einstein Spaces presents the mathematical basis of the theory of gravitation and discusses the various spaces that form the basis of the theory of relativity. This book examines the contemporary development of the theory of relativity, leading to the study of such problems as gravitational radiation, the interaction of fields, and the behavior of elementary particles in a gravitational field. Organized into nine chapters, this book starts with an overview of the principles of the special theory of relativity, with emphasis on the mathematical aspects. This text then discusses the need for a general classification of all potential gravitational fields, and in particular, Einstein spaces. Other chapters consider the gravitational fields in empty space, such as in a region where the energy-momentum tensor is zero. The final chapter deals with the problem of the limiting conditions in integrating the gravitational field equations. Physicists and mathematicians will find this book useful.